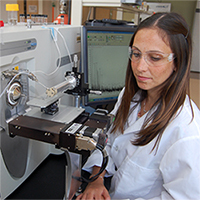 Our analytical chemistry program is especially well known for students and faculty developing new instrumentation and measurement strategies. Strong departmental support has been the foundation during our 75-year history. The Jonathan Amy Facility for Chemical Instrumentation assists these efforts. Facility personnel have diverse backgrounds in chemistry, electrical engineering, and systems programming. Analytical chemistry has been influential in a variety of ways both on and off campus. Faculty and students have been involved in Discovery Park, the Indiana Proteomics Consortium, the Chemobile, Bioanalytical Systems, Griffin Analytical Technologies, and Endocyte. Analytical chemistry at Purdue is more than Purdue analytical chemistry!